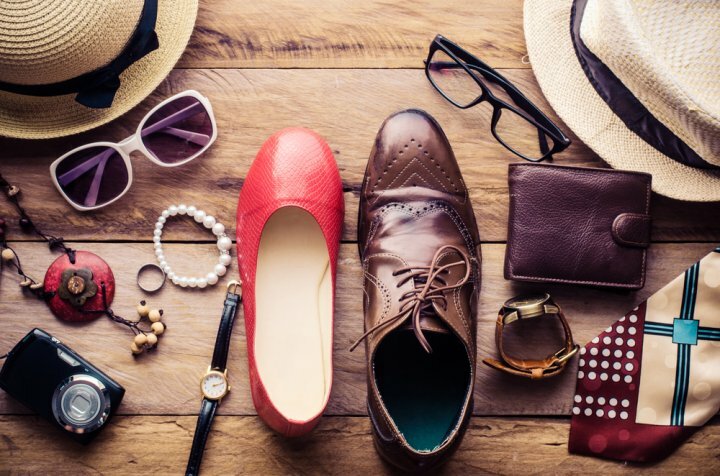 Women have a very intimate connection to their wardrobe, which is why they love splurging on trendy styles, attractive prints and vibrant coloured outfits. Whether you choose ethnic wear or western apparel, Kurtis seem to be an essential part of both types of fashion wear. 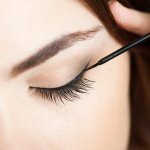 There are a number of styles that are trending and have made their way into most closets for their blend of ethnicity and contemporary styling. For instance Pakistani Kurtis are popular for their spirited and exceptionally traditional charm. Longer in length, most Pakistani Kurtis are straight and loose, embellished with heavy work, captivating prints and art designs with a vibrant combination of colours and sheen that makes them ideal for grand occasions, like a wedding. There’s colour block kurtis with a bright range of hues, exhibiting large blocks of contrasting colours making a bold statement, featuring different appealing patterns that are drop-dead gorgeous and beautiful, apt for college girls or working women to add to their personal style quotient. Whether it is a casual event, work, a party or a festival Kurti is loved by most and is available in a large variety of colours, prints, sizes, patterns & shapes in the most vibrant colours. 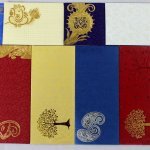 Kurtis have evolved immensely in the recent times, when they were mostly donned by men, and then became popular with the ladies in the way that they can be adapted to changing trends with bigger & better designs & styles, paired with denims, salwars, jeggings, leggings, pants, trousers, skirts & so on! In setting up your personal style, it is important to consider a number of points that will enhance your personality. For instance, if you prefer being minimalistic, mono-chrome kurtis would look classy on you, with a definite style statement. Then there’s a wide range of bold hued kurtis in stripes, high on the fashion radar. The fabric plays a key role in enhancing or downplaying your outfit so its important to choose one that doesn’t stick to your body frame. With varying necklines that look good on different body structures and comes in all sizes, cotton kurtis, long kurtis are a must have, befitting most events, both in the day and in the night. With the right kind of accessories, colours and jewelry, you’ll be the talk of the town! A kurti can make any girl/woman look graceful and smart, when styled differently and paired with different sets of bottom wear. If you’re one for exploring different styles, try these trending combinations for a unique style statement. Pair your kurti with a flared skirt and wear it to a wedding or an evening reception. Salwars are comfortable and have enough volume. You can experiment with a fitting kurti and a salwar for semi-casual outings in contrasting colours. Known as soul sisters for Salwars, Dhoti Pants look really chic and smart for most mehendi or sangeet functions. Denims are the ever-so favorites for pairing with kurtis. Comfortable, stylish and great for accentuating your curves, Jeans can be worn every day and a kurti would look best with a pair of skinny jeans. Palazzos being in vogue these days, a short kurti would look endearing with a pair of Palazzos and best for formal occasions with a super snug and stylish outfit. Slim works best with skinny leggings and a printed Kurti for a glamorous look, while a kurti with a Sharara or divided skirt is both contemporary & functional, when paired together in bright colours. Straight fitting silk pants look stunning for both an ethnic or sophisticated style with a pair of high heels. The Black and Red Designer Kurti is made of a heavy cotton fabric which is extremely lightweight and soft on the skin making it a comfortable outfit to carry on, all day long. Adorned with a unique cut and pattern, with a lovely print that makes the kurti visually appealing, this fully stitched kurti is apt for weekends, a party or a special event. With a bright red torso in a boat shaped neckline, the kurti has a shiny gold border at the waist and sleeves which are three-quartered and then flares down in a beautiful geometric pattern, again with a shiny gold border at the hemline. Pair up the designer kurti with a churidar or leggings for a contrasting effect with strappy heels and stylish accessories. This kurti is priced at Rs.1,799 and is available on Ethnik Mall. The Front Slit Embroidered Designer Kurti is a stitched Georgette Kurti in Maroon in full length. Measuring 44” in size, it has a flare of 2.5m and is embellished with multi-coloured floral work embroidery. The Designer Kurti has a gotta patti from the center of the round neck to the waist, where it opens up in a front slit, exposing the midriff. Decorated with floral embroidery, the kurti has a colourful work of emerald green, royal blue, baby pink, rani pink and yellow intricately filled in. Priced at Rs. 999 on Zipker, pair this chic and stylish kurti with a pair of denims, for an evening out. This opulent kurti, coloured gray-beige, is a ready to wear outfit in rayon with decorated prints and handwork making it stand out. Lightweight and perfectly designed for good fitting and comfort, this designer kurti is ideal for weekend events, parties or outings and would look really smart with fashionable accessories and high heels. With a shirt styled collar and cape style upper torso, the kurti has a multi-layered look with a combination of gray and beige colours blending in smartly. The kurti has tree embroidery on the cape part in similar colours with a gray tassle on each tree, open cut sleeves and a small tassle hanging on the sleeve opening as well. The kurti has gray piping and panel border on the hem of the cape and sleeves and flares falling like a dress. Priced at Rs.1,699 on Peach Mode, the Gray-Beige Kurti is available in sizes Small to 2XL. The Cream Coloured Printed Kurti, available in sizes small to 2XL is styled as an Anarkali, with a V-neckline and a tassel tie-up on one side, with cold shoulder sleeves and flared hem. Apt for special occasions, the Anarkali Kurti has three quartered sleeves with a solid print pattern with subtle grey print all over. 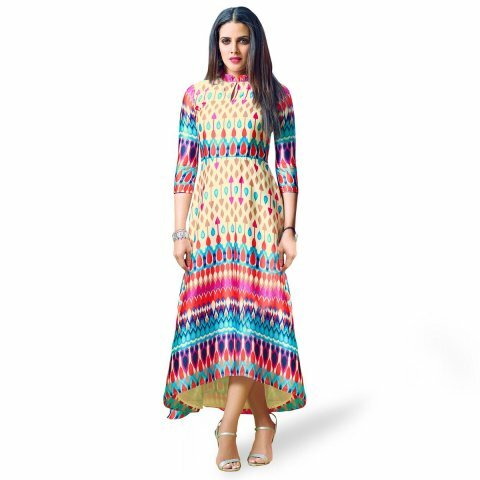 Teamed with dark denims or black leggings, and high heels, accessorized with a stylish handbag, this printed Anarkali Kurti is an ideal, comfortable and stylish outfit for both casual and special occasions. It is available on Myntra and is priced at Rs.1,194. The semi-stitched plain dhoti styled kurti is made of cotton fabric in mustard colour. Designed knee-length the kurti measures 44” in size and comes with a stitched bottom in cotton fabric in mustard colour as well. Dhoti styled kurtis are preferred a lot these days for their unique style and pleasing designs. High on comfort and contemporary styling with numerous designs and patterns, the dhoti styled kurtis are convenient to wear, different and look really smart. 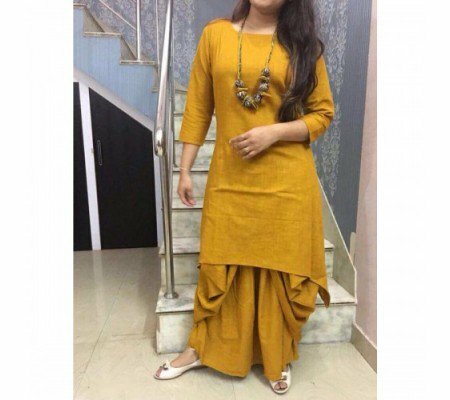 This plain mustard coloured dhoti style kurti can be accessorised with a colourful necklace set or antique metal jewelry with a pair of ethnic footwear or peep-toes. It can be purchased from Zipker at Rs.999. The Lemon Embroidered Kurti from Mirraw made in georgette fabric and measuring 40” in length is adorned with Chikankari designs like the phanda, keel kangan and shadow effects of bakhiya, perfect to flaunt saritorial summer elegance. Apt for festive occasions, the kurti has a round neckline and full sleeves with a slight peachy coloured paneling on the neckline and at the hem with open side slits. The delicate chikankari embroidery on the kurti gives it a very traditional yet delicate appeal, making it a beautiful outfit to showcase. Paired with a salwar with similar embroidery or even plain, the Embroidered Kurti would go well with morjaries for footwear. It is priced at Rs.1,999. The Navy Blue A-line High Low Kurti is made in Georgette with regular sleeves and a mandarin collar. 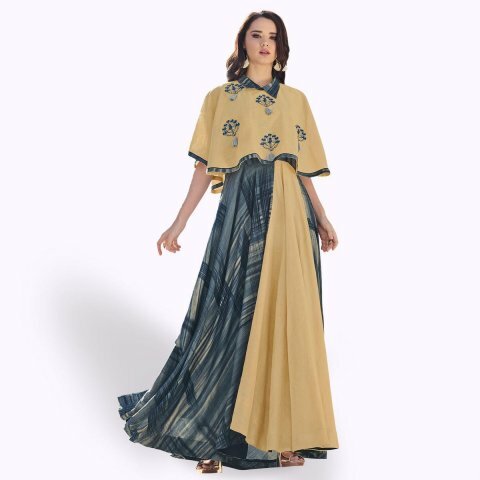 Available in sizes small to 2XL, the kurti is styled plain with a length little below the waist on the front and length right at the back of the knees on the back. 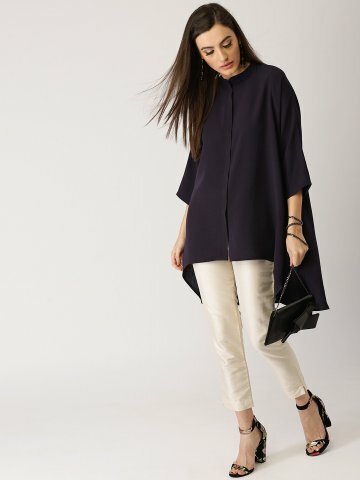 Worn with cigarette pants or ankle length leggings in a contrasting white or off-white colour and high heels, the high low kurti would look even more stylish with dark coloured dangler earrings and a smart evening purse. The navy blue A-line kurti is priced at Rs.799 and is available on Libas. Made in rayon fabric in a grey coloured solid pattern with plain styling, this Mandarin collared Kurti comes designed as a dress with mega sleeves and a gathered cowl drape in sizes small to large, with a round neck and closed back. Stitched, this ankle length kurti looks really smart and fashionable with a pair of ankle length leggings and ethnic footwear, with some really smart and stylish hoop earrings, delicate bangles and an evening clutch. The Grey Mandarin collared kurti dress is priced at Rs.625 on Craftsvilla. The printed kurti in light yellow from Peach Mode is a fashionable outfit with a mesmerising design, created on a lovely Japanese satin material with a heavy crepe lining, stylised with colourful patterns, making it perfect for party wear, social duos and special events. Paired with Churidars or Leggings in contrasting colours with high heels and pretty dangler earrings and colourful bracelets, the printed kurti would make for a comfortable wear. Given its styling, the light yellow coloured printed satin kurti can also be worn as a dress! Available in sizes small to 2XL, the party wear kurti is priced at Rs.897. With a tasseled bodice and triple cold-shoulder sleeves, this Sky Blue Denim Kurti is a straight cut kurti made in a cotton blend fabric with a solid pattern. Available in sizes small to XL, the half-sleeved Denim Kurti has solid embroidery work and has a dull print on the upper back portion of the kurti as well. 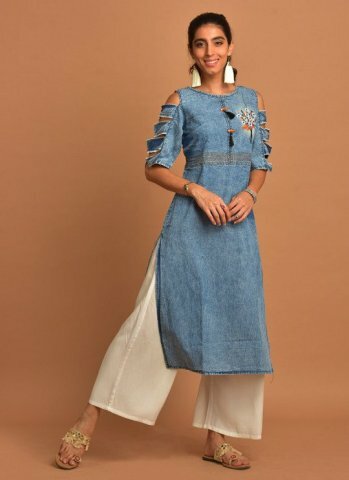 With a floral embroidery and tassels on the bodice and dull grey coloured paneling just below the ribcage, the Denim kurti looks really chic with white Palazzos and ethnic flats and a pair of tassel dangler earrings. You can team the outfit with a dainty bracelet on one wrist and a lovely watch with a delicate design on the other. The sky-blue denim kurti from Craftsvilla is priced at Rs.1,023. Most people confuse between kurtas and kurtis. However, they are different in the way they’re styled and in their lengths. A kurta is usually knee length or at mid-calf length, while a kurti is shorter and is usually waist or mid-thigh high. Most women prefer kurtis for their lightweight feature and loose fitting which makes it easy for them to go about their work without getting burdened with the weight of the cloth and it is easy to travel in as well. Cotton Kurtis are the best when styled loose, with a V-neck or oval neckline, and apt for traveling purposes. When styling a kurti, here are a few ideas on how to lead the style brigade! Go monochrome with clothes in same colour shades. Pair your kurti and bottom wear in the same colour family, with flared pants to make heads turn around! Different bottoms add different dimensions to the same outfit. Palazzos aren’t just trendy or fashionable but very comfortable. A long kurti paired with a medium flared palazzo or a simple white palazzo will add to your height and grace. A skirt, either with medium flares or long length will look really smart with both short and long kurtis. Team up a white kurti with a colorful long skirt or pair a colorful kurti with a complementing coloured long skirt. 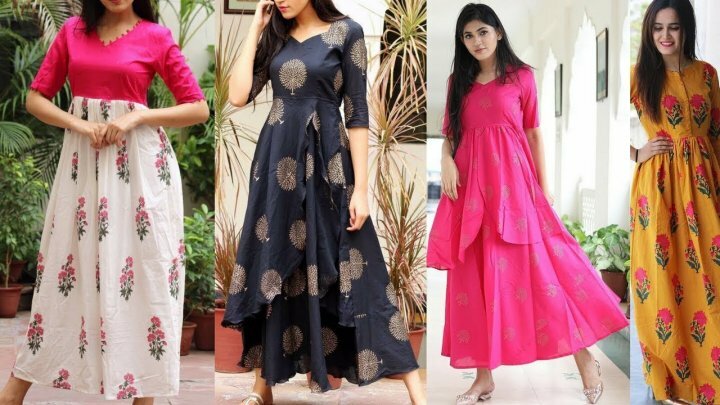 Slim pants are in vogue which have transformed the ethnic look of the kurti as well and made it quite a comfortable and fashionable choice of apparel. When choosing a kurti, it is wise to select one that complements your body and features, primarily in terms of its length, fabric and colour. If you’re tall, you can easily carry your kurti with Patiala salwar in addition to Palazzos or skirts. Avoid teaming it up with leggings though. If however, your built is short, then wear leggings or slim pants with slit kurtis. Footwear is equally important in adding to your style. If you’re wearing a heavily embroidered kurti, ethnic juttis is the best choice, especially if you pair your kurti with a Patiala salwar. High heels work well with ethnic kurtis too, making you look elegant and tall. Flats can be explored for both casual and party wear for a good height. The new designs in kurtis are something that every girl should know about. These days, you have kurtis with pockets, kurtis that can be worn as dresses, and similar such designs. It makes the apparel even more likeable and makes you look like a fashion diva in your friend circle. Style the ensemble properly and you are sure to make heads turn.